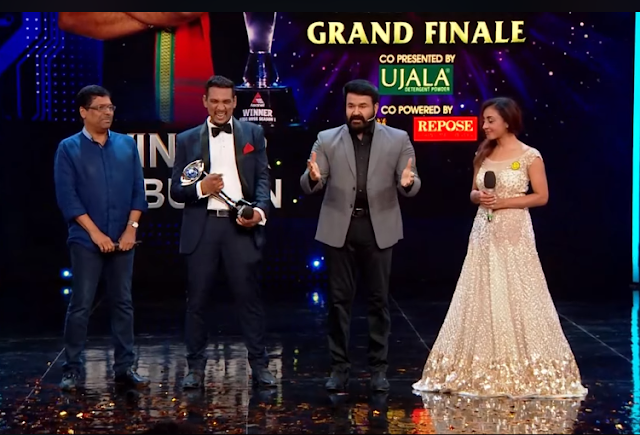 Malayalam Bigg boss winners list| Asianet Bigg Boss Malayalam season 1 title Winner | Winner of Asianet Biggboss Grand Finale | Telecast of Malayalam Bigg boss grand Finale. Sabumon Abdusamad is the title winner of Asainet Bogg boss malayalam show. Pearly Maaney, Shiyas Kareem, Sreenish Aravind and Aristo Suresh, got second to fifth place. Details below. The winner of season 1 of the reality show Bigg Boss Malayalam. You will get an answer on September 30th, 2018. 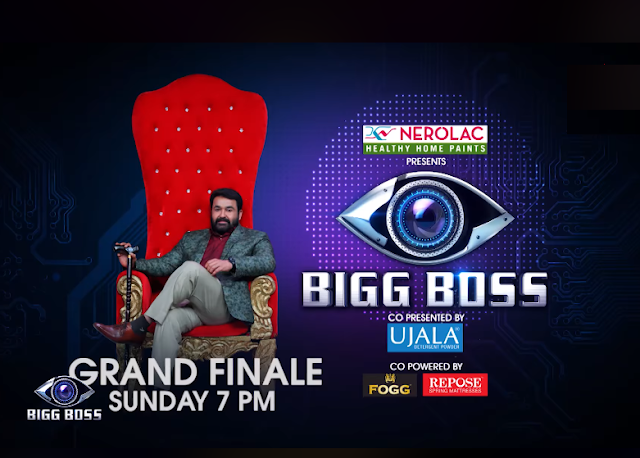 The grand finale of Bigg boss malayalam will be aired at 7:00 PM on Sunday, 30th September, 2018 . Five finalists are competing for the title - Aditi Rai, Aristo Suresh, Pearly Maaney, Sabumon Abdusamad, Sreenish Aravind, Shiyas Kareem. Archana Suseelan was evicted on 23rd September while Basheer Bashi on 16th September 2018. Asianet has launched the Bigg Boss Malayalam show on 24th September , 2018. Since then its aired every Monday to Sunday. The full videos and latest episodes of Malayalam Bigg Boss is available on hotstar-official portal of starindia. You can watch the grand finale also there. Grand Finale, telecast date and time : 30th September 2018. 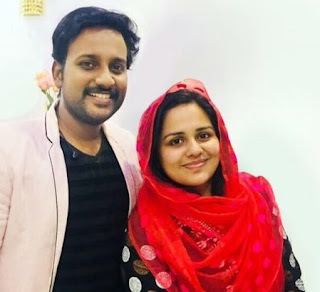 Title winner of Bigg Boss Malayalam :Sabumon Abdusamad -First Prize -won 1 crore rupees worth of flat from confident group . The bigg boss malayalam grandfianle was a colorful ceremony . The ex-contestants of the show performed on the stage along with music concert by Stephen Devassy. Mohanlal host of the show also sang many songs for the viewers. There were also skit performance by other artists. Aristo Suresh was evicted first . Host Mohanlal called Aristo Suresh to the Bigg Boss Malayalam stage.Among the five finalists, Suresh has received the least amount of votes and has been evicted from the house. He is offered a leading role in one of the movie directed by T. K RAjeev Kumars movie Kolambi. Then Mohanlal called Srinish Aravind to the Bigg Boss Malayalam stage. Srinish Aravind says he will talk to Pearle Maaney's parents. Mohanlal wish him all the best. Then Mohanlal anounced the votes received by Pearly Maney and then Sabumon. Pearly got 1.53 crores vote .Sabumon Abdusamad is declared the winner as he got 1.86 crores votes. Asianet Director Madhavan anounced that the voting is done by an independent agency, bigg boss contestants received more than 5 crore votes in total for the grand finale. 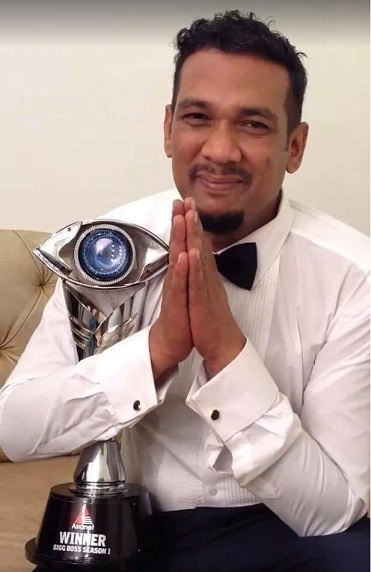 Mohanlal handover bigg boss trophy to Sabumon. Pearle Maaney is a popular malayalam actress, anchor and RJ . She became very popular through D4 Dance reality show on mazhavil manorama. Pearle debuted as host of Malayalam programs including Amrita TV's Taste of Kerala. She has also acted in Malayalam Movies like Neelakasham Pacha Kadal Chuvanna Bhoomi, The Last Supper Etc. She is also a singer . She was the co-host of acting reality show Nayika Nayakan before entering the malayalam Bigg Boss show. Sabumon Abdusamad : is an actor and TV anchor in Malayalam industry. He is known for his TV show ‘Tharikida’ from which he was also called Tharikida Sabu. He has also hosted a popular Malayalam TV show Take It Easy and was a judge of Mazhavil Manorama’s popular reality TV show Midukki . He debuted in Malayalam film industry as an a ctor Nakshathrakkannulla Rajakumaran Avanundoru Rajakumari (2002). Other Malayalam films are Fireman, Acha Dhin, Double Barrel, Katha, Punyalan Aggarbattis and Adi Kapyare Kottamani. Sabumon is a graduate in n Law from University College, Thiruvananthapuram, Kerala. He worked for Lufthansa Airlines in Saudi Arabia ,but he left the job within a few years to fulfill his dream of becoming an actor. Srinish Aravind :Srinish Aravind, also refereed as Srinish Nair or Srinish Aravind Nair is an Indian model and an upcoming actor. He debuted through Asianet Malayalam Television Serial, Pranayam. The success of his role as Sharan Menon in this serial paved ways to other projects in other launguages including Vamsam (Tamil) Ammuvinte Amma (Malyalam) ,Naticharami (Telugu). He has also acted in Tamil movies Kuttrame Thandanai. He started his career as a model and has also appeared in short films (eg: Rise Up, written, directed by Robert Runcie). Shiyas Kareem : is a model, fashion groomer, judge of various fashion shows and actor. He entered the Bigg Boss house as a wild card entry. Shiyas Kareem is one of the popular models in Kerala and represented many national and international brands in several ramp shows. He represented India at the prestigious Mr. Grand Sea international Model Hunt 2018 and had won the titles like 'Mr popularity' and 'Best photo model'. Shiyas appeared in two Malayalam films Veeram and Captain. He is also part of celebrity cricket tournament. The announcement of Malayalam Bigg Boss was made in May 10, 2018 (Photos of Asianet Bigg Boss was launching function) . Asianet bagged Malayalam Super Star Mohanlal as the host of the show . The actor recently also hosted a chat show Lalsalaam-The complete actor on Amritha TV. 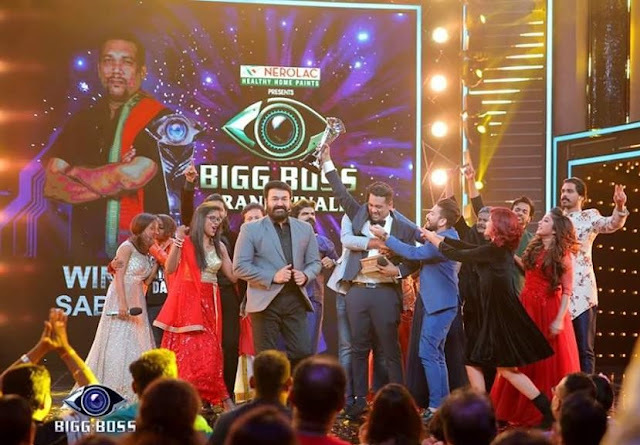 Malayalam Bigg Boss was launched on June 24th, 2018. Asianet Bigg Boss Malayalam show is launched as a part of celebration for completing 25th anniversary of Asianet. Presented by Asianet and produced by Endemol Shine Productions, Bigg Boss features 16 celebrities living together inside a custom made ‘Bigg Boss’ house for 100 days. The participants will be completely cut off from the outside world – they will have no access to internet, phones, television or newspapers. With no way out to distract themselves, each participant will have to compete with others inside the house to complete various tasks; they will be tracked and monitored by 60 robotic & manned cameras continuously. The lavish Bigg Boss house will have all necessary comfort to stay for 100 days. The show in Bigg boss format is not new to Malayali Audience. Asianet Bigg Boss Malayalam is a replication of the old reality show called ‘Malayalee House on Surya TV’ telecasted on Surya TV. Rahul Easwar was the winner of the show. Each week, the housemates voted contestant for eviction. The contestant were selected to contnue was decided by viewers according to the channel. There are three methods for Bigg Boss Malayalam voting - Google search , missed call or SMS voting .Using google seaserch Bigg Boss Malayalam vote online is possible from any country other than India. Aditi Rai (actual name : Sylvia Dominic ) is an actress and model works mostly in South Indian Cinema especially Kannada, Telugu , Tamil and Malayalam.She made her acting debut in the 2011 Kannada film Prince while she was studying in class twelve. Anyarku Praveshanamilla is was her first malayalam movie.